Crackdown 3 tech analysis: a console classic reborn? Xbox One X, Xbox One S and PC versions tested. The journey towards Crackdown 3's release has not been a smooth one - but after some four years in development, the game is finally complete. 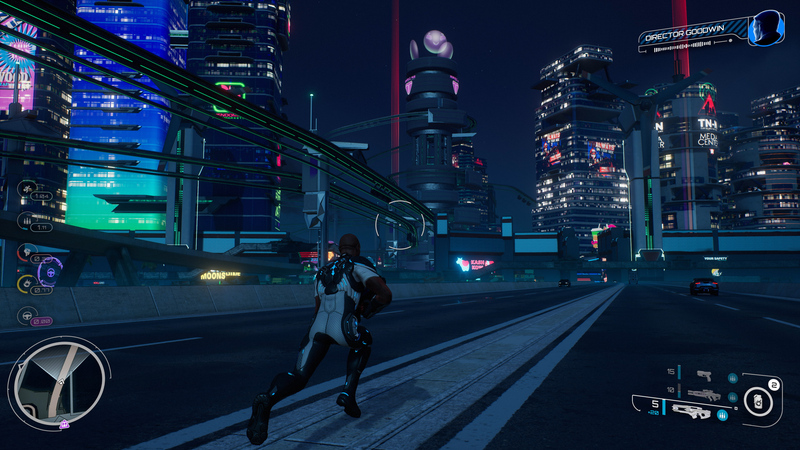 Its troubled history and dodgy trailers left us concerned about the quality of the final product but as it turns out, the campaign portion of Crackdown 3 is actually an accomplished and often beautiful game, using Unreal Engine 4 innovatively to deliver a unique visual style, paired with the best HDR implementation we've seen since Gran Turismo Sport. Whether Crackdown 3 delivers as a sequel comes down to how closely wedded you are to the original's chaotic anything-goes open world and the introduction of more structure here. Opinion may be divided on this one, but the core gameplay delivers much more than I expected, and I think one of this game's strengths is just how much of an actual sequel this is, as opposed to a reboot or a 'reimagining' of one of Xbox 360's finest hours. So, what is Crackdown 3? It's well known at this point that the 'power of the cloud' destruction demo shown back in 2015 has not been fully realised in the final game, certainly not in its campaign segment. And this is fascinating because Crackdown 3 is, in effect, two entirely separate games created by different companies seeking to deliver their own unique experience. They're even separate downloads on the Xbox Store. The closest relative we get to the initial 2015 demo is Wrecking Zone - a destruction-driven multiplayer game that only opened up to reviewers in a very limited fashion less than 24 hours ago. 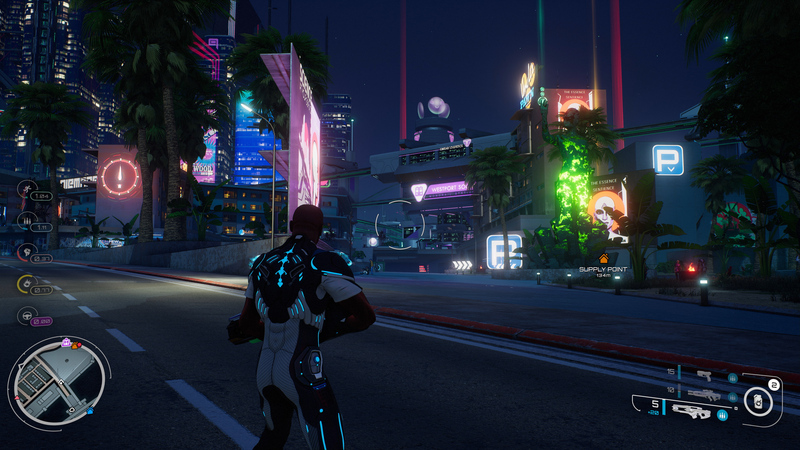 We'll be back on that soon, but our emphasis in this piece is on Sumo Digital's work on the single-player/co-op portion of the package, which is essentially, what Crackdown 2 should have been - a revamped, upgraded sequel to the original game with an emphasis on high-speed traversal and verticality. The world island on which Crackdown 3 is set is gorgeous and massive in scope but it takes a very different approach to its visual make-up than your typical open world game - something true of the original as well. 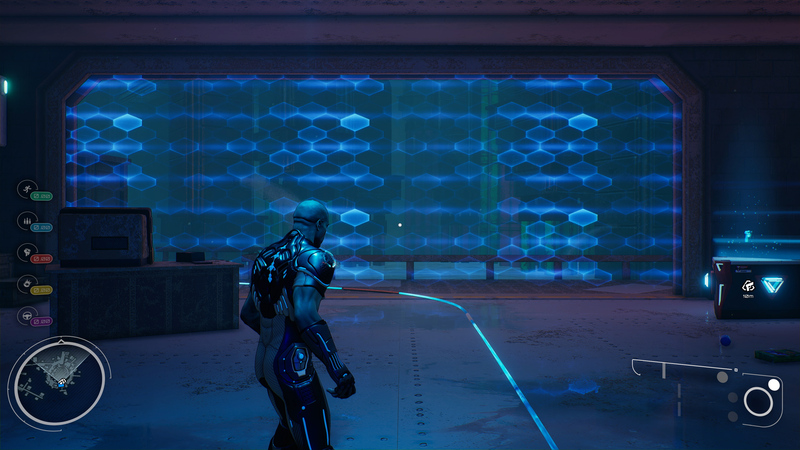 Crackdown 3 is all about simple, abstract shapes, vibrant colours and lighting. In that sense, the world more closely resembles something from Halo as opposed to Grand Theft Auto. Ramps, bridges and twirling roads spiral off in all directions as if from some Trackmania-inspired urban fever dream - and it works beautifully in creating something that can look very special indeed. Our technical breakdown of Crackdown 3, including analysis of all versions of the campaign section of the game. Crackdown 3 isn't pushing any new boundaries in terms of rendering techniques or detail but what makes this game original and distinct is that it carries its own unique visual language. Without the clutter of a modern open world city, it also feels more explorable and easily readable. Bridges and walkways are simple platforms, hallways are often featureless, and surfaces kept simple. That's the key benefit - it looks different to anything else, while the clean design of the world helps to reduce the overall rendering load. While playing, it's the dizzying sense of scale and height that really sells the world. Running high above the streets, platforming between buildings and climbing the tallest towers feels wonderful - but how wonderful depends somewhat on your platform choice. There is no bad version of Crackdown 3, but there is an obvious pecking order, depending on whether you're gaming on Xbox One X, Xbox One S or PC. The game is an Xbox Live Anywhere title meaning that one purchase gets you access to all versions, though on PC, navigating the Windows Store is still annoying - and the encryption on PC's files limits any kind of modding potential. 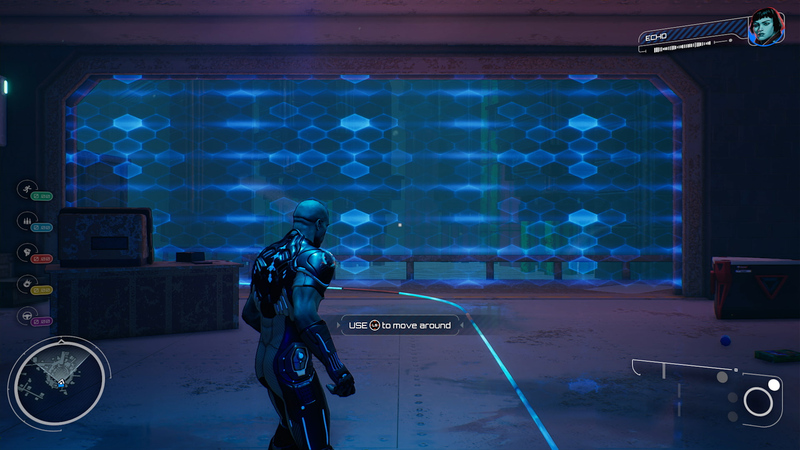 In terms of the rendering basics, the Xbox One X rendition of Crackdown 3 runs with a dynamic resolution feature. In this case, the game manages to hit and maintain native 4K most of the time, but it can scale specifically on the horizontal axis with a maximum reduction to 60 per cent of 4K. Which means it can go as low as 2304x2160 in the worst case, but this kind of drop is extremely uncommon. This is coupled with Epic's temporal anti-aliasing, with a touch of additional post-processing on top of that. As a game focused on long draw distances and clean, abstract shapes with hard edges, the high resolution makes a lot of sense and I think 4K TV users will be pleased. On the base Xbox One or Xbox One S, the maximum resolution drops to 1080p instead with the same potential lower bounds of 60 per cent. Unlike Xbox One X, however, the Xbox One S seems to struggle more often to maintain native 1080p and we often noted resolutions at or near 1536x1080 during combat or fast driving, though it can go lower. Considering what we've been seeing lately with other base Xbox One games falling short of the quality delivered by other consoles, these results are better than average. 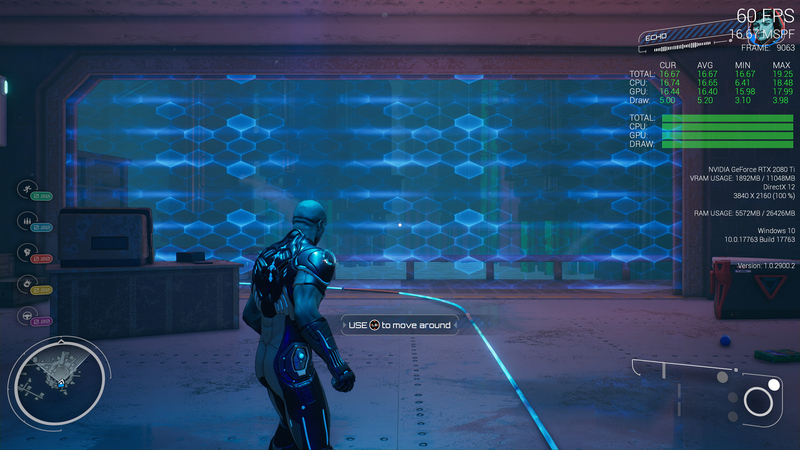 If you're playing on PC or Xbox One X, Crackdown 3 includes higher-resolution 4K textures which are plainly visible from the start. The Xbox One S is blurrier both in terms of output and texture resolution as you'd expect. The city skyline appears more detailed and refined on PC and Xbox One X with the lower tier system lacking fine texture and object detail. Curiously, there is what appears to be additional image grain present on PC that is lost on the others, not to mention a difference in gamma - a problem we've started noticing in multiple Xbox One games. Once on the street, the PC versions the highest quality distant detail using the extreme preset but Xbox One X comes in right behind. Shadows and building detail remain visible at a greater distance than on Xbox One S. Note: if you're seeing extra detail on X to the right of the agent's head, that's actually a train! Check out the building at the end of the road here - on Xbox One S, the proper structure has yet to materialize due to more aggressive LOD management. Also note the missing Moonshine sign to the left. Of course, performance on the PC version varies according to your hardware, but Crackdown 3 includes a lot of options to explore. The menu is packed with visual settings including rather granular options such as tweakable TAA and a sharpness slider. Dynamic resolution scaling is also an option here and the title features one of the best in-game performance metrics displays I've ever seen - it'll even tell you what dynamic resolution it's operating at during any given point. Naturally, high resolutions are supported, but I'm also happy to see that ultra-wide resolutions can be used as can frame-rates above 60fps. All of this means that the PC version offers the chance to push visuals beyond the Xbox versions if you have the hardware to do it, and the game even manages to look good on low settings. Essentially, the further up the preset chain you go, the further the detail level stretches into the distance. The bottom line is that Crackdown 3 looks similar across all platforms but manages to scale as you'd expect. On Xbox One S, distant detail, traffic density and the like are all scaled back versus the other platforms. These elements are increased on X and naturally, PC users can go even further. The one limitation here, however, is that traffic density in co-op play is determined by the lowest spec machine in use. If you're playing with a friend using an Xbox One S or base system and you're on the X, all versions will share the same reduction in density in order to prevent de-sync. It makes sense but it's something to note. You should also expect to see some interesting features cut back on the vanilla Xbox One. So for example, one of my favourite visual details are headlight shadows - when driving around, everything casts shadows and the results are remarkably clean, and even AI cars project shadows - but the effect is missing completely on base Xbox hardware. It's not surprising, but this demonstrates that some of the finesse is missing - shadow quality is also visibly pared back on the standard console too. Thankfully, while the base experience is reduced overall, the game still looks good across all platforms. And it's certainly the case that the key highlights of the experience are present and correct on all systems. Crackdown 3 is all about scale, which is conveyed through its unique skyline. Monorail tracks, roads, crazy towers and the surrounding ocean all work in tandem to create this massive, awe-inspiring cityscape. Throughout the world, surfaces are absolutely slathered in materials featuring reflections. Screen-space reflections are relied upon here and the implementation, likely Unreal's own, works supremely well - third-person games with lots of shiny surfaces don't always play nicely with SSR but that's not the case here. It all blends together nicely, and occluded objects fade out in a less than distracting way. 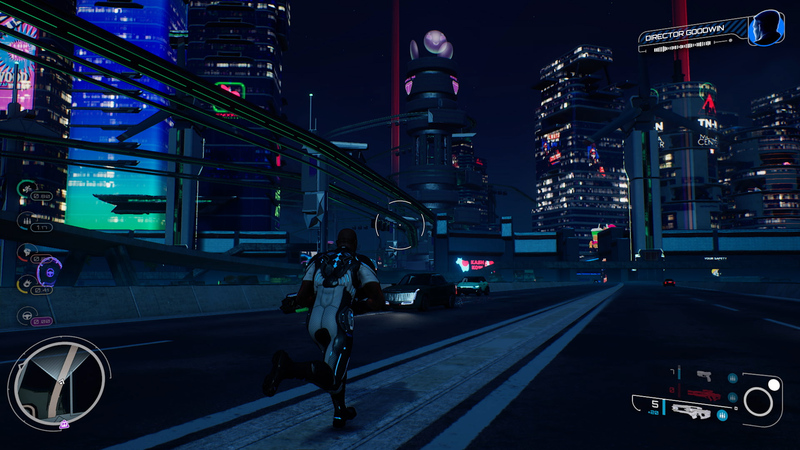 With its emphasis on neon, scale, verticality and simple but effective surface shading, Crackdown 3 presents a unique open world that really comes into its own on Xbox One X and PC's higher settings. Then there's the neon lighting - signs, light pipes and LED strips are used everywhere in this world - it's exactly the kind of vibrant colour that was missing from the originals and sits perfectly in the HDR presentation. This all works in combination with the game's excellent materials system. There's a lot of both realistic and fantastical materials in the game world but the physically-based assets are key in supporting the presentation. With so many large, flat surfaces, individual material properties become more important. Plastic, metal, dirt and cement all stand out and look great. Of course, colours are nothing without light and with this focus on simple shapes, lighting plays a huge role in Crackdown 3. Firstly, the game employs a real-time global illumination system which, based on available and viable options within Unreal Engine 4, suggests we're looking at light propagation volumes. The idea is to simulate real-time GI using spherical harmonics and a compute shader-generated voxelised representation of the scene's geometry to simulate light bounce and secondary occlusion. A height-fog is also present across the city, helping to create additional depth around the world. We've seen some fantastic open world environments this generation, with some titles capable of generating some stunning, highly realistic cityscapes - like Marvel's Spider-Man, for one. You can't really go into Crackdown 3 expecting the same approach. The objective here is to deliver something closer to Mirror's Edge but even then, something that's even less grounded. I must admit, I enjoy the wide-open spaces devoid of clutter more than I expected. The bright colours, the unique design of the city and the focus on platforming makes moving through this world more interesting than usual. It's akin to Sunset Overdrive, but less automated. The quality of an open world experience is tied closely to performance and by and large, there's good news here. For Xbox One X, with its high-resolution target and the fact that it's an open world Unreal Engine 4 title, I was skeptical that Sumo Digital could deliver - there aren't a lot of examples of UE4 console games running at or near 4K with worlds of this size. The target is 30 frames per second then and impressively, the final code holds it for the vast majority of the duration. In fact, during the many hours I played the game, I only noticed a couple of dips, manifesting as a clutch of torn frames at the top of the screen and a small frame-time blip. During the heaviest combat sequences, it's possible for this to occur but that's really it. Even then, the resolution generally sticks to native 4K. Driving through the world is also suitably smooth - there is no hitching, skipping or stuttering anywhere. It's just remarkably stable throughout. Just a reminder that the original Crackdown on Xbox 360 is X-enhanced and running at native 4K on the latest Microsoft console - and it's still awesome. The older Xbox systems don't fare quite as well. Performance is fine for the most part when considering the limited hardware, and the overall showing is better than the original on Xbox 360. However, compared to the X, it's easy to see more prolonged bouts of screen-tearing and lower frame-rates - even though resolution, effects and detail are cut back compared to Microsoft's enhanced machine. PC performance is fine overall, and achieving 60 frames per second locked is not too difficult for the most part. However, Crackdown 3 does appear to have some background streaming issues that kick in regardless of how powerful your CPU and GPU are. I initially installed the game onto a mechanical 7200rpm hard drive and found that traversal or even looking around could instigate some really noticeable stutter. Moving the game onto SSD (something the Windows Store allows for now without redownloading, thankfully) dramatically improves the situation but doesn't fully resolve the problem. I really hope that Sumo can address this. 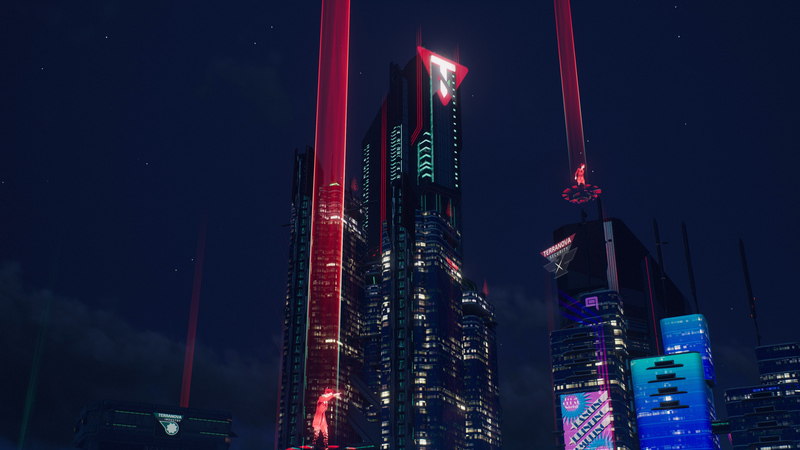 Looking at the big picture, whether you find Crackdown 3's aesthetic appealing is going to be a matter of opinion - but there's no denying that it's different. I like the design a lot, with its huge sense of scale and impressive structures. The important thing here, though, is that it's technically solid and that it really is a true sequel to Crackdown. It's very much the next step from the original game and plays very much like it - but what you can't expect from the campaign portion of the game is any of the insane destruction seen in those initial materials. That's exclusive to the Wrecking Zone mode and we'll be reporting back on that once we've actually had the chance to play it. I can understand the disappointment for those expecting the 'power of the cloud' to manifest in the single-player game, but it should be clear that Sumo Digital's Crackdown 3 was never intended to feature such destruction. Honestly, I'm not sure it would make sense. With a focus on collecting orbs and platforming, being able to take down structures would break the level design. The city itself is also far more complex in terms of design compared to Wrecking Zone - and indeed the cityscapes revealed in those older demos. But just to stress it one more time - what you do get really is a proper Crackdown sequel that honours the concept of the original while delivering visuals worthy of current generation hardware. It looks great, plays just as you would expect from a Crackdown game and runs smoothly too - especially so on Xbox One X. An American living in Germany, John has been gaming and collecting games since the late 80s. His keen eye for and obsession with high frame-rates have earned him the nickname "The Human FRAPS" in some circles. He’s also responsible for the creation of DF Retro. Good for justice, bad for your health. A complete list of games playable in Netflix-style service Xbox Game Pass. Party functionality to come with a post-launch update.